We’ve been applying hair extensions in Manchester for 15 years and get lots of calls about hair extensions for fine hair, it’s one of the top reasons for having hair extensions applied. If you haven’t been blessed with a great head of hair, you’ll know how disappointing and difficult to manage it can be. Having thin/fine hair can limit what styles you can wear – it can look stringy if you try to grow it, even a short bob can look unruly. It can make you feel less feminine, it can be ageing and it can make you feel less attractive. All these things can affect your confidence. It’s not surprising we get so many enquiries about hair extensions for fine hair. If you have thin/fine hair, your bathroom cupboard is probably bursting with “volumizing” products. But, these work best on people with lots of fine hair. If you haven’t got a lot of hair to work with, you won’t see much improvement, certainly not the change you were hoping for. It’s not like you don’t put the time in, you can spend ages blowing or curling your hair, teasing it into a style that makes it look fuller. You might even be happy with the result but as soon as you step foot outside, just a gust of wind can undo all your hard work. And you don’t need me to tell you what drizzle can do. You don’t get a break in hot weather or when you’re on holiday either. Humidity, a glow of perspiration or a dip in the pool can leave your hair looking (and you feeling), flat. Does this sound familiar? Our salon specialises in hair extensions in Manchester City Centre. And, while all our clients have differing and unique needs, those who have hair extensions for fine hair told very similar stories. Unless there’s a medical reason or you have a vitamin/mineral deficiency (if you think there could be, get it checked out), fine/thin hair is down to genetics. Just like you can’t change the size of your nose or eye colour by taking vitamins, supplements or eating certain food types, you can’t change how much hair you have or how thick it is. Trust me, I’ve tried. You can have the healthiest lifestyle and best diet in the world, but it won’t alter the density or structure of your hair. In other words, if you’re thin/fine hair is down to genetics, you’re stuck with. Why hair is thin or thick, sparse or full. According to the Stanford School of Medicine, it’s the shape and size of your hair follicles that determines how thin or thick your hair is. Hair follicles are tiny pockets just under the surface of your scalp that your hair grows out of. Hair follicles affect hair thickness in two ways. The size of the individual hair follicle determines how thin or thick each strand of hair will be. Thick/coarse hair is produced in large follicles, whereas small hair follicles produce thin/fine hair. The number of follicles that you have on your scalp will determine your hair density. Those with lots of hair follicles will have more individual hairs, their hair will be thicker and fuller. Those with fewer follicles will have thinner or finer hair. So, if you’ve got medium to large follicles, and lots of them, you’ve won the hair lottery. What can you do? You can’t change your DNA and you’ve already tried every style and product known to man. Maybe it’s time to take action. Choosing the right hair extensions for fine hair (and making sure you look after the hair you have). When clients with thin/fine hair get in touch for the first time, one of their biggest concerns is the health of their natural hair and the damage they fear hair extensions might do. They’re right to be worried. If you choose the wrong hair extensions or have them fitted at a salon who don’t specialise in hair extensions for fine hair, you could lose some of your natural hair. In some cases that hair loss can be permanent. Unfortunately, not all salons who fit hair extensions in Manchester use a method, or have the experience to safely work with fine/thin hair. Hair extensions for fine hair need to be applied carefully. The size of each strand must match the section of natural hair it’s being attached to. And, because the density of your hair changes in different areas of the scalp, the size of each individual hair extension must be continually adapted too. Applying hair extensions that are too heavy can pull your natural hair out by the root. Factory made hair extensions are a big no no if you’ve got fine hair. These include pre-bonded micro rings/beads, nano rings, tapes and wefts. They are “one size fits all” methods that are too heavy and bulky for fine/thin hair. Consider the type of hair being used too. Slavic Russian hair is by far the best choice when making up hair extensions for fine hair. It weighs less than any other hair type, but it also has much more body. This means that fewer, finer hair extensions will give you a fuller result than if you use heavier, thicker, cheaper hair. And although this is the most expensive hair, because you won’t need as much, the price level’s out. 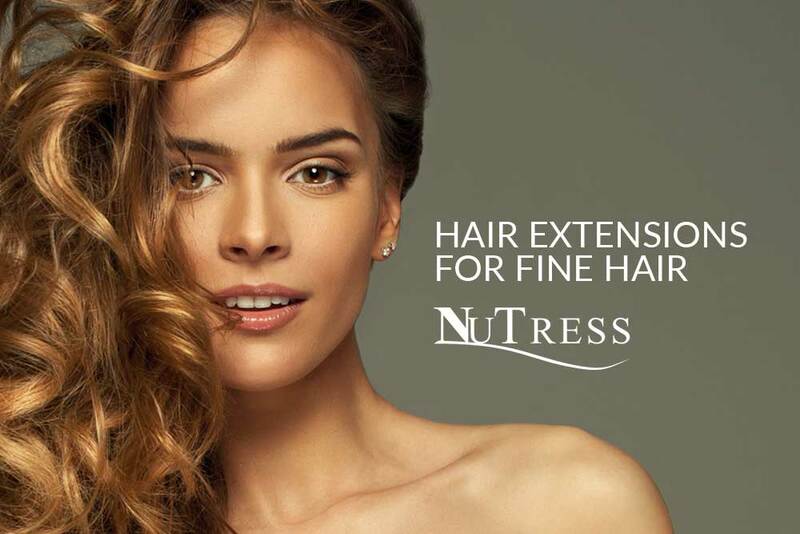 NuTress are the only salon to fit Virgin, double drawn, tailor-made hair extensions in Manchester. What to look for when choosing a salon. Not all salons that fit hair extensions in Manchester are specialists. When choosing a salon, ask to see examples of work they’ve done on clients with thin hair. If the bottom of the hair looks unnaturally full compared to the top (creating a triangular shape), you need to get out of there! It can be tempting for you to add as much hair as possible but consider the damage this WILL do. And make no mistake, unsuitable hair extensions WILL damage your natural hair. Do you really want to end up with even less hair, in a worse place than when you started? Not all salons behave ethically. You might think they’ve got your back and would let you know if there was a problem, you’d be wrong. You might not notice the damage their hair extensions are doing to your natural hair, until it’s too late. Be proactive. When you have your hair extensions removed, ask to see photographs of your scalp before they’re reapplied. Remember, hair extensions should be a choice, not a necessity. Anyone can claim to specialise in hair extensions for fine hair. It takes just 1 morning to add volume that will last for 3 months. A few, well placed, good quality hair extensions could be all it takes to put some oomph into your locks. If you’re feeling stuck in a rut with your fine/thin hair, maybe it’s time to act. Hair extensions are great for adding body and volume, and your hair will hold a style with much less effort than you’d put in without them. And, because you won’t need to use heated tools so much, back comb, tie your hair back, etc. hair extensions for fine hair could even improve the condition of your natural hair. If you’re looking for hair extensions in Manchester, call us on 01612582015 to book a free, no obligation hair extension consultation. We can answer your questions about hair extensions for fine hair and even apply a couple free of charge. This gives you a chance to go away and get a feel for them before you decide to book. We love to hear from you! Please leave your feedback and comments and let us know if you have any other questions.